The Niger State Police Command has arrested 35-year-old Shuaibu Ibrahim of Safiu village in Toto area of Nasarawa State with a human eyeball. The police operatives apprehended the suspect in the early hours of Thursday following a tip-off from a member of the public. The eyeball was said to have been removed from a victim of a communal clash between the Igbira and Bassa people in Nasarawa State. The suspect told the correspondent that he was the intermediary between Ojo and his customers, who were buyers of human parts. Ibrahim said, “My duty is to deliver human parts given to me by Ojo to his clients across the northern states. We make quick money in this business but I cannot tell what the buyers are using the parts for. 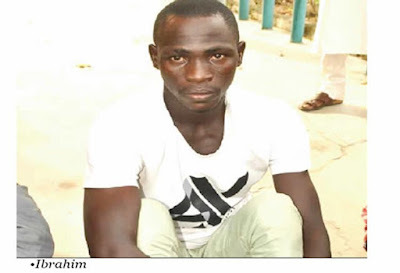 The Niger State Police Public Relations Officer, Muhammad Abubakar, who confirmed the arrest of the Nasarawa State indigene, said said the suspect would be charged to court after the completion of police investigation.